It’s early in the morning and I’m alone out on the deck. Far away the blue sea mixes with the grey sky and forms a blurry horizon. It doesn’t matter in what direction I look, it is all the same: grey and blue. Araon that appeared so large back in the harbor is now a small red dot in a seemingly eternal blue ocean. Araon is a Korean icebreaker that during this expedition to Antarctica and the Amundsen Sea brings along about 40 scientist: biologist, chemists, meteorologists and a group of physical oceanographers. I belong to the latter; I’m a physical oceanographer. That means that I try to find out how the ocean works – where do the currents go and why? In a way it’s like meteorology, but in the ocean. 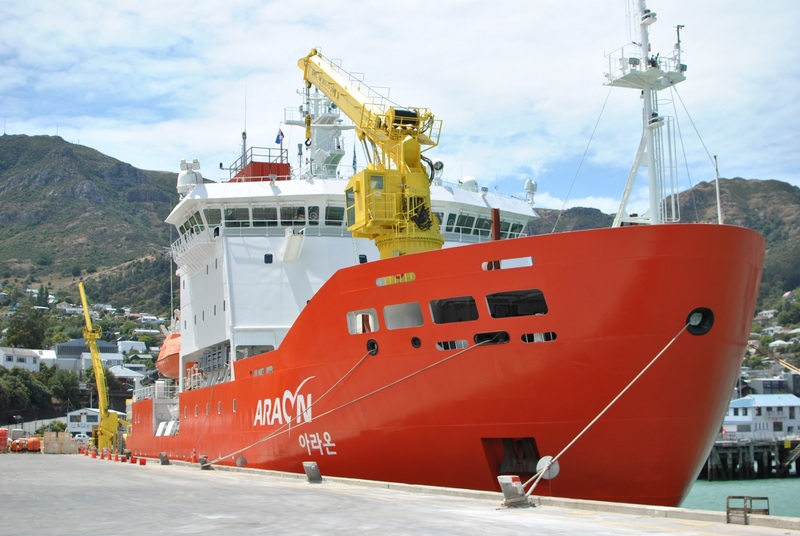 I boarded Araon more than a week ago in Christchurch, new Zealand in order to – when we finally get there – deploy instruments on the continental shelf around Antarctica. Araon in the harobur of Christchurch, Nya Zealand. Our stay here was prolonged due to trubble with the engines. We were supposed to be down there by now, in the ice – but an hour or so before we were set out on New year’s eve they discovered a leak in the engine so the departure was delayed and we couldn’t do much but hang out and wait for the technician’s to repair and fix the problem. Most of the ice cover around Antarctica is seasonal, that is it grows during winter and melts away during summer – compared to the Arctic there is very little ice that survives the summer (You can read more about the differences between sea-ice in the Arctic and Antarctica here: https://nsidc.org/cryosphere/seaice/characteristics/difference.html, but close to the continents the ice remains. 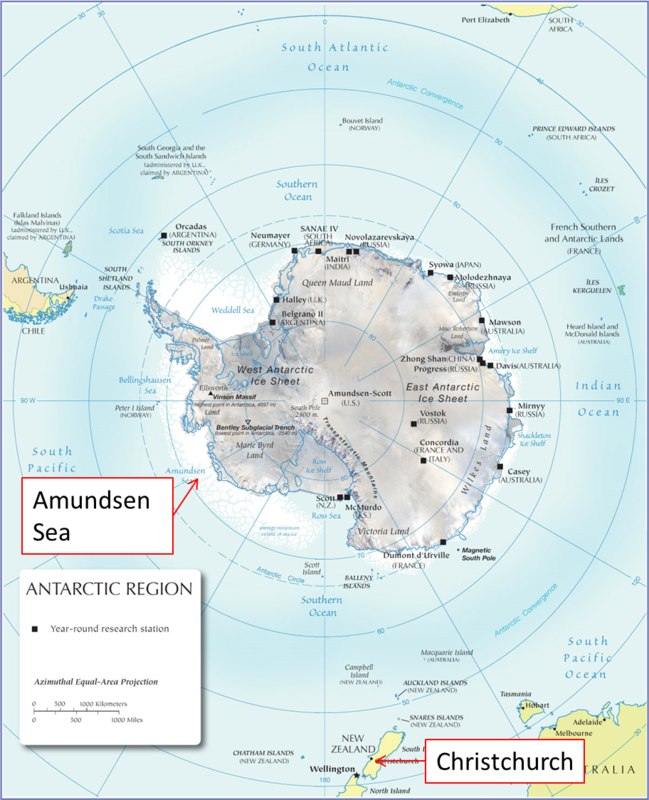 You can see how much ice there is around Antarctica here: http://www.iup.uni-bremen.de:8084/amsr2/ (The pictures from Antarctica is at the bottom of the page Antarctic). Sea ice is not only beautiful but also important. It is crucial for the marine biology (everything from large seals to small algae lives on or in it), for the ocean below it (it isolates the ocean from the cold atmosphere and influences the properties of the seawater below by separating the fresh water from the salt) and for our climate, since the white ice will reflect the incoming solar radiation while the dark ocean absorbs it. But the best thing about ice (at least in the opinion of a sea sick oceanographer), is that it effectively “kills” the waves… right now, there are quite big waves and the ship is rolling back and forth, back and forth, back and forth. We are crossing over the Southern ocean, and there is a reason why one tend to talk about “the roaring forties, the furious fifties (where we are now) and the screaming sixties… All equipment has to be secured and tied down, if not it would be flying around. I was up more than once this night to pick up things that were rolling around on the floor. My stomach is also “rolling”, and I didn’t manage to eat very much of the Korean breakfast: soup, fried small (3-4 cm long, you eat the head and everything!) fish and egg, and then off course rice. The breakfast looks much like lunch and dinner! 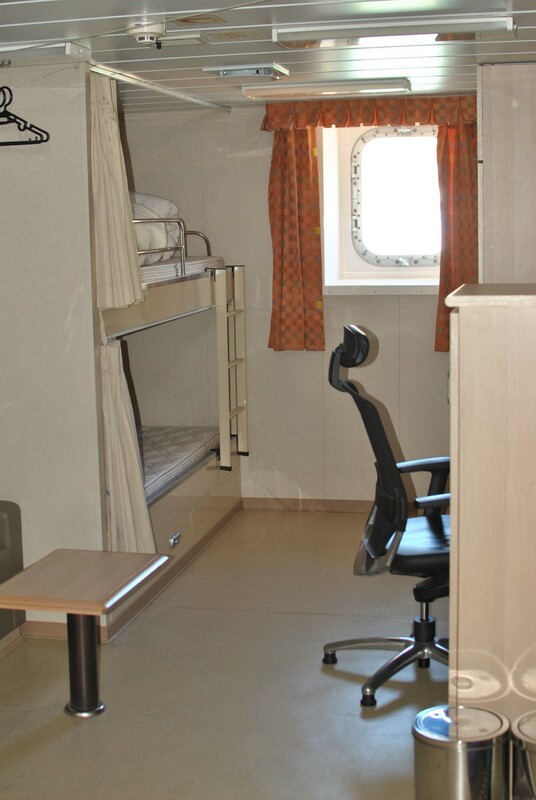 My room the next seven weeks. I share cabin with Isabell from France. Map of the Antarctic region. New Zealand at the bottom to the right!